Computational Geometry is a forum for research in theoretical and applied aspects of computational geometry. The journal publishes fundamental research in all areas of the subject, as well as disseminating information on the applications, techniques, and use of computational geometry. Computational Geometry publishes articles on the design and analysis of geometric algorithms. All aspects of computational geometry are covered, including the numerical, graph theoretical and combinatorial aspects. Also welcomed are computational geometry solutions to fundamental problems arising in computer graphics, pattern recognition, robotics, image processing, CAD-CAM, VLSI design and geographical information systems. 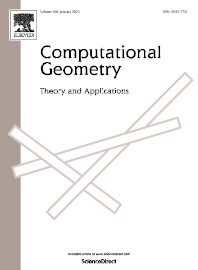 Computational Geometry features a special section containing open problems and concise reports on implementations of computational geometry tools.